What does it mean to have a dream? How do you achieve a dream? This Parenting Publications Award Winner is our signature package! It’s a Dreamer’s Activity Kit for children 6-10 created by Grammy Award-winning songwriter and children’s artist Bunny Hull and acclaimed illustrator Synthia Saint James. 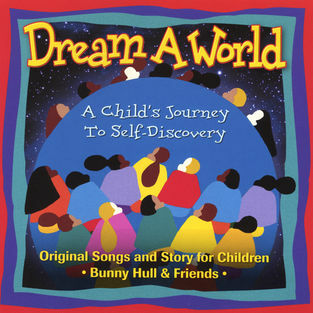 Parent’s Choice Silver Honor Award Winner Children’s Music Web Winner Grammy® Award-Winner Bunny Hull brings more meaningful themes to children through music with this magical, musical adventure in self-discovery.This CD and book explore the creative process through original song and the creative arts, music. story, poetry, writing. drawing and fun creative exercises, which allow children to discover the importance of having a dream and how to make that dream come true. Perfect for parents and educators who are looking for positive ways to interact with their children. The music and story CD, which is also available separately, features Bunny Hull, joined by actors Ron Glass, Elayn J. Taylor and new young pop singer Nick Holdz. Songs include: I Am Somebody, Dream A World, Pass It On, Flow Like A River, Circle Of Creativity, Follow Your Heart, Over The Sky And Under The Moon, Saphinne and The Young Master (Story) Master Of My Dreams, That’s The Way It Works, Pledge To Myself, The Mind Is A Funny Thing, Beautiful People, I Am Somebody (Reprise) and Free To Be Me (Instrumental).